Mudcrab Merchants, Silt Striders, and Prized Chickens. Part of the appeal of The Elder Scrolls: Legends is simple brand recognition. A part of my brain just likes to hear familiar characters recite their battlecries when they are summoned, and gets a thrill out of shouting "FUS!" at a mudcrab. But back when Legends launched, that feeling was tempered by disappointment—not in the game, which is more interesting mechanically speaking than its Healthy Sibling, but in its artwork. A few too many of those cards depicted characters in cliched RPG sourcebook poses: illuminated by things that glowed with generic mysticism, holding their signature weapon while frozen awkwardly mid-attack, that kind of thing. Fortunately, each expansion has made Legends look a bit more distinctive. It's not always been a smooth transition. A couple of the cards added by Heroes of Skyrim got the number of legs dragons have wrong (they're supposed to have two), and even ignoring the legs, Alduin didn't look anything like he does in the game. Then again, that expansion also gave us Prized Chicken, which summons a full lane of Angry Villagers when destroyed. The Clockwork City and Houses of Morrowind expansions continued adding oddities like the Mudcrab Merchant and the Sheepish Dunmer (who is summoned by Stolen Pants, and hides in the water until they are returned to him). 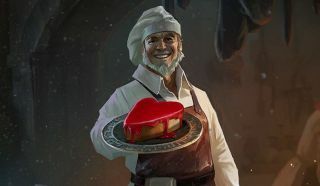 Alternate card art for Laaneth, the elf companion from the singleplayer storyline, has her corrupted by clockwork, while an alternate version of the Grisly Gourmet given away as a login reward on Valentine's Day shows the chef who transforms your enemies into sweetrolls giving an eerie grin. A few of the dark elf cards are just people lit by glowing things, but on the whole it's been a huge improvement that bodes well for the Isle of Madness expansion. Here's a small gallery of art from Legends' current cards. I apologize if the Silt Strider makes you reinstall Morrowind and go hunting for mods that make it look as good as this.